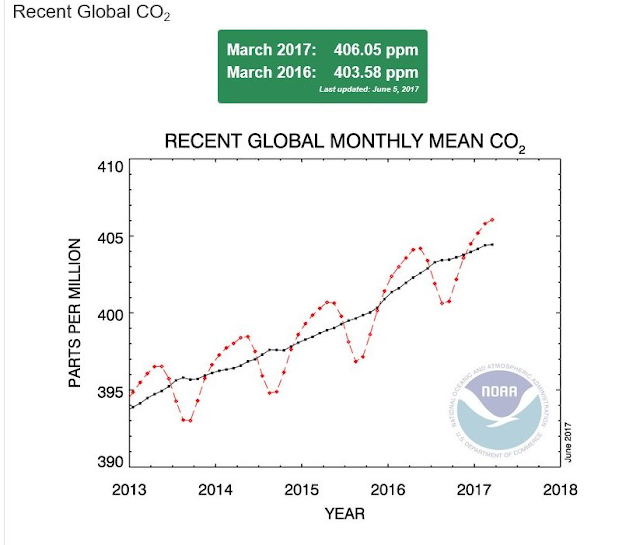 The reported NOAA ESRL global CO2 for March, 2017 hit a new record high of 406.05 ppm, which was 2.47 ppm higher than March, 2016. This new milestone continues the ongoing increases of atmospheric CO2 that has been reported since 1980. The monthly CO2 increase of 2.47 ppm over March, 2016 was the record 27th consecutive month of increases of at least 2 ppm over the prior year. This reflects the acceleration of atmospheric CO2 increases through the last three years, when human emissions supposedly leveled off. The increase of 2.47 ppm is lower than the blistering 3+ ppm monthly increases every month of 2016. 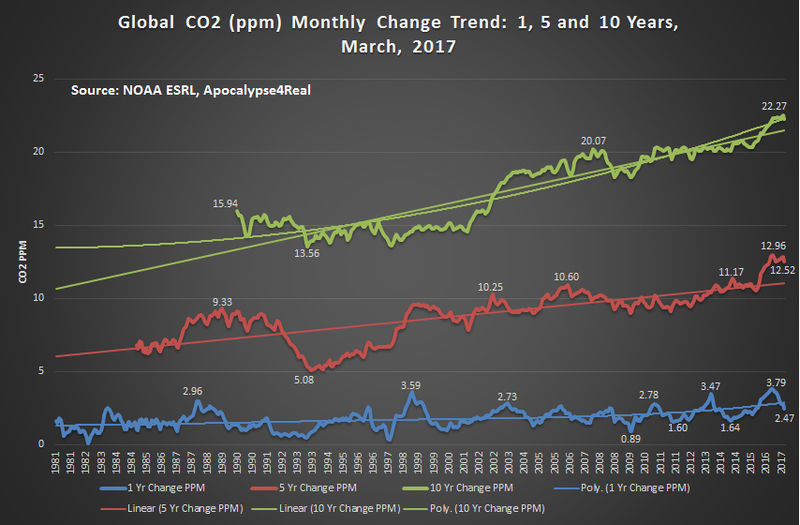 The 5 year change was 12.52 ppm over March, 2012, which is the record 13th month of five year increases over 12 ppm, a level never reached before March, 2016. 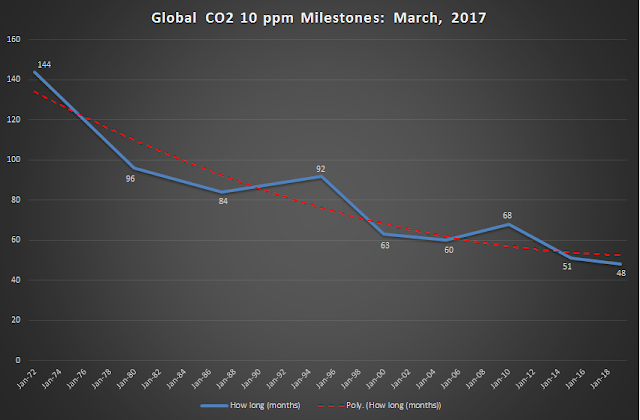 The 10 year global CO2 change was 22.27 ppm higher than March 2006, an unprecedented 9th month above a 22 ppm increase over the same month a decade earlier. 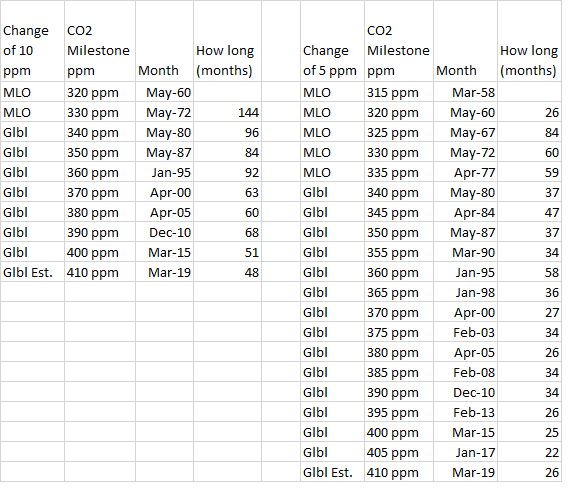 It is this accelerating achievement of global CO2 milestones that caught my attention this month. If we incorporate Mauna Loa data, beginning in March, 1958, with the global record commencing in January, 1980, the increasing pace of toppling milestones becomes glaringly apparent. The 5 ppm milestones fall faster, beginning in the 1980's. 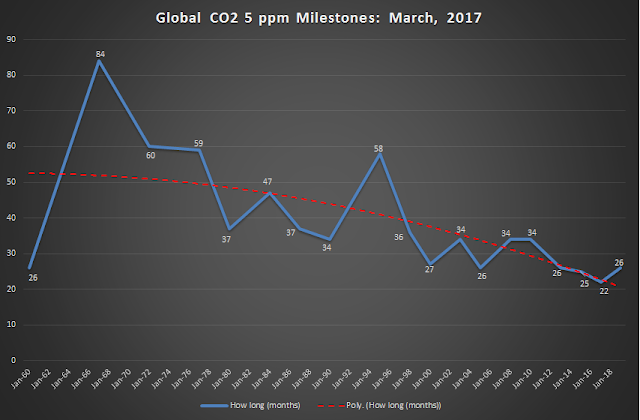 With the most recent 5 ppm increase occurring in only 22 months, between March, 2015 and January, 2017. Even if a slowdown in the increase occurs, it is not unreasonable to assume that by March, 2019, we will globally surge through 410 ppm. If one steps back to the increases by 10 ppm, some of the variability smooths out, but the trend of decreasing time frames to each milestone is still a sobering slide. 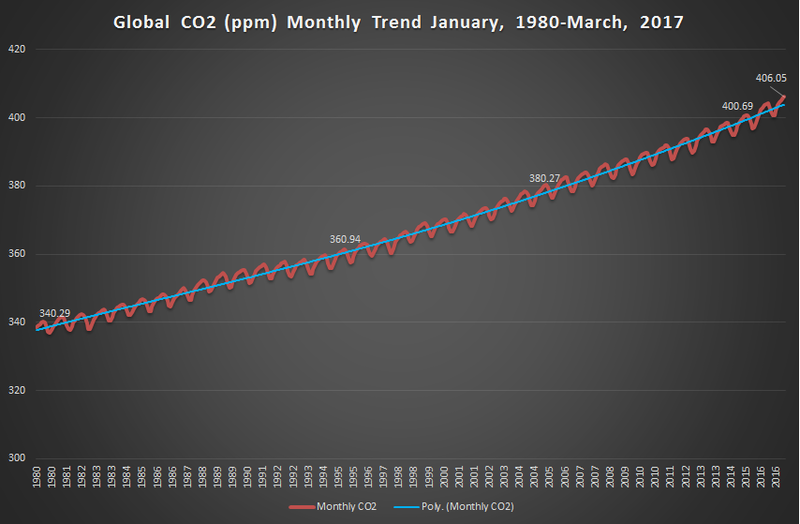 Given the sustained rates of increase, March, 2019 is presumed to be the month we reach 410 ppm globally, and we will have reached that milestone in only 48 months. With this historical data in mind, what does this portend for future increases? 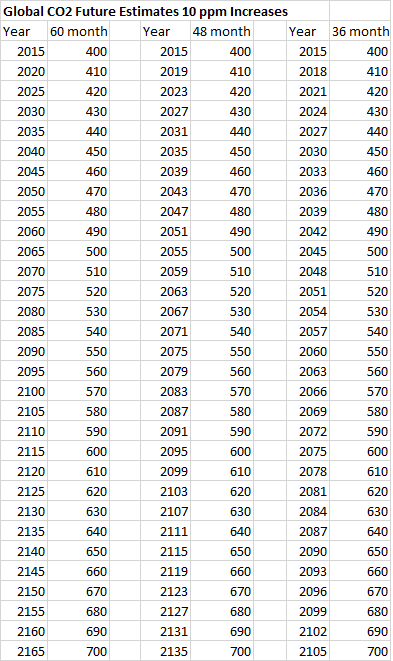 If we hypothesize that the acceleration from 390 to 400 ppm was an anomaly, and that 60 months better represents the future rate of 10 ppm CO2 increases, we reach 410 ppm by 2020, 470 ppm by 2050 and double CO2 from the pre-industrial levels, reaching 570 ppm by 2100. However, if the lower trend rate is assumed, adding another 10 ppm globally every 48 months, we reach 490 ppm by about 2050, and 610 ppm around 2100.
if we do not control global CO2, and a tipping point is reached that leads to a 36 month 10 ppm increase in CO2 (which was the rate of global CO2 increase during 2016), then the results are deeply troubling. CO2 potentially reaches 520 ppm by 2050, and 690 ppm by about 2100. I am hopeful that steps taken by the international community will slow these trajectories during the next 10 years. Of course this will not include efforts by the current US administration, who have earned the notorious stigma of making the US a climate pariah state. 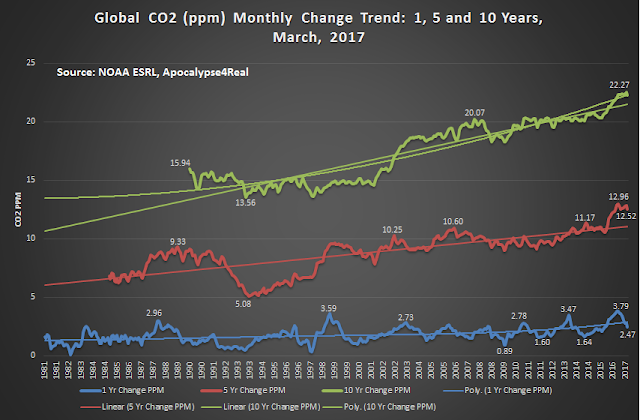 Finally, the 406.05 ppm of March, 2017 is 19.62% higher that March, 1980. We are edging closer to a 20% increase in atmospheric CO2 in less than 40 years. The impacts will be felt far into the future.